The pattern is 3 pages and written in English. 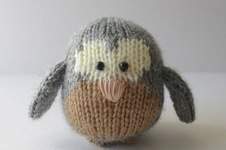 Cricklewood is a sweet little owl, knitted in soft and cuddly alpaca yarns. TECHNIQUES: All pieces are knitted flat on a pair of straight knitting needles. You will need to cast on and off, knit, purl, work increases and decreases, and sew seams. The pattern incorporates intarsia colour-work. FINISHED SIZE: The owl is approximately 8.5cm tall.